Lady Gaga postpones two Paris shows over "logistical difficulties"
Are the protests affecting you? Please share your images and stories with CNN. Paris, France (CNN) -- French unions called Thursday for two more days of protests against government plans to raise the retirement age, as lawmakers cut through red tape to try to make the proposal law within days. Six major unions called for nationwide demonstrations on October 28 and November 6, saying that protests so far show the people are ready to dig in for the long haul. More than a million people have turned out to protest against the proposal to raise the retirement age from 60 to 62, a move the government says is necessary to save money. The French Senate adopted new rules Thursday to speed up voting on the controversial pension reform bill. They now could pass their version as soon as Friday, meaning a final version could be sent to the president as soon as early next week. Thousands of people demonstrated in central Paris on Thursday while the senators were voting. Lawmakers, trying to wade through more than 1,000 amendments -- many put up by opposition senators to try to derail the bill -- will group them together rather than voting on each one, Labor Minister Eric Woerth announced. He said debate on the bill had gone on longer than on any other bill since the Fifth Republic came into existence in 1958. About 4,000 people -- mostly students -- were out demonstrating against it on Thursday, police estimated. The march was largely peaceful, CNN's Phil Black at the scene reported, although there were confrontations between students on the one hand and riot police and undercover police in the crowd on the other. 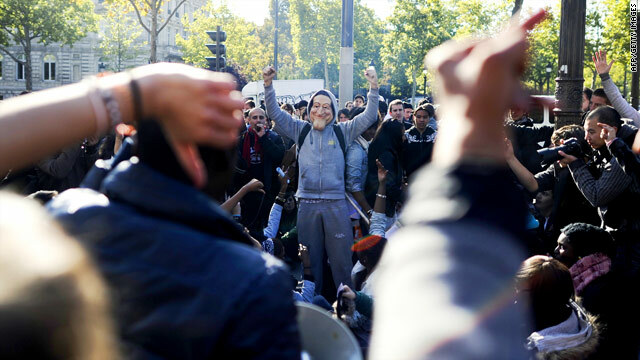 The protesters marched through the city, blocking intersections as they headed for Place Denfert-Rochereau, a central Paris square that has seen many demonstrations over the years. Some 200 demonstrators blocked France's Marseille Provence Airport for more than three hours Thursday as strikes and protests continued across the country, trade unions said. But some people are losing patience with the demonstrators, some of whom are causing fuel shortages. A middle-aged woman who said she had been looking for gas for her motorcycle for an hour said people have "had enough." "We are really sick of these idiots who are turning our country upside down. We have had enough of all these horrible trade unions that are messing up this country. That is all I have to say," said the woman, who refused to give her name. The country continues to face some fuel shortages because workers are on strike at all 12 of the nation's refineries, and protesters are blocking 14 of the country's 219 oil terminals. Pop star Lady Gaga postponed two Paris shows this weekend because of "the logistical difficulties due to the strikes," her website said. "Unfortunately, as there is no certainty that the trucks can make it to the Bercy [sports arena] for this weekend's shows, the Lady Gaga performances are now postponed," the statement said. The lower house of parliament has already passed the bill, by a vote of 329 to 233. If there are substantial differences between the Senate and National Assembly versions, a conference committee will have to iron them out before the final version goes to President Nicolas Sarkozy. That could happen as soon as Monday or Tuesday, lawmakers said -- before the next planned protests. France has been reeling from the strikes. Police and protesters clashed Wednesday, and on Tuesday, 428 people were arrested in connection with the demonstrations. About 1.1 million people demonstrated across the country on Tuesday, French media quoted police as saying. Unions put the figure at 3.5 million nationwide that day. The ongoing strike follows a series of one-day strikes this month and last month. The strikers have crippled transportation, and affected schools and fuel supplies. Students from high schools have been skipping classes to join the protests. Some students told CNN in Paris that they are worried they won't be able to get jobs if the current generation hangs onto jobs for an extra two years. French authorities unblocked three fuel depots Wednesday after the president ordered police to break blockades by strikers. "We did it because the west of France is threatened by a very severe shortage of fuel. The opening of these three depots was essential and will gradually allow normal activity to resume," Interior Minister Brice Hortefeux said. The French government contends that the country cannot afford the earlier retirement payments. "I will implement the pension reform because my duty as head of state is to ensure that French people and their children can count on retirement and that the amount they receive will be maintained," Sarkozy said Wednesday. CNN's Pierre Meilhan, Alanne Orjoux, Jim Bittermann, Saskya Vandoorne and Niki Cook in Paris contributed to this report.